Doyle Brunson is probably the best poker player ever, with 10 WSOP bracelets and decades of poker experience. Now you can join his room and learn for the greatest, play against him and his son Todd, who is also a professional poker player, and other guests like Jamie Lynn Sigler from "The Sopranos" and "The Mad Genius" Mike Caro. 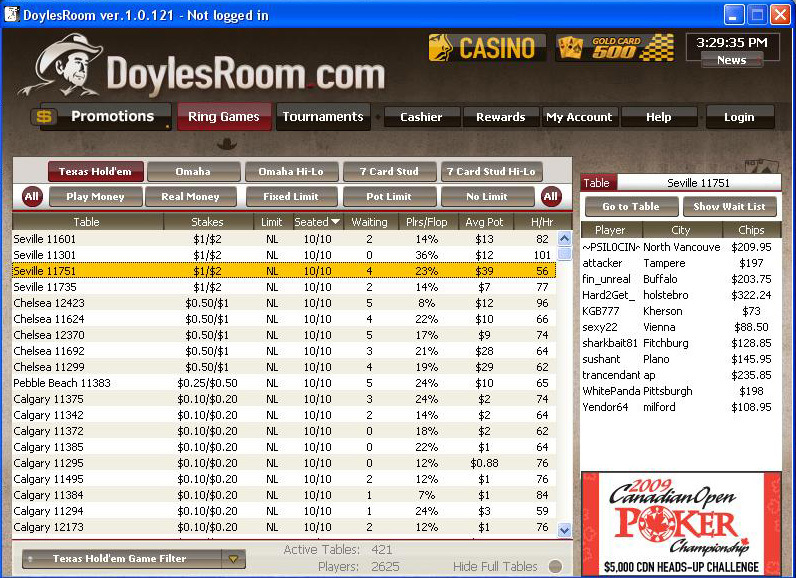 At Doyles Room you will find all the best, popular and known poker games today. You can take your seat and play Texas Hold'em, Omaha, Omaha Hi-Lo, Seven Card Stud, and Seven Card Stud Hi-Lo. 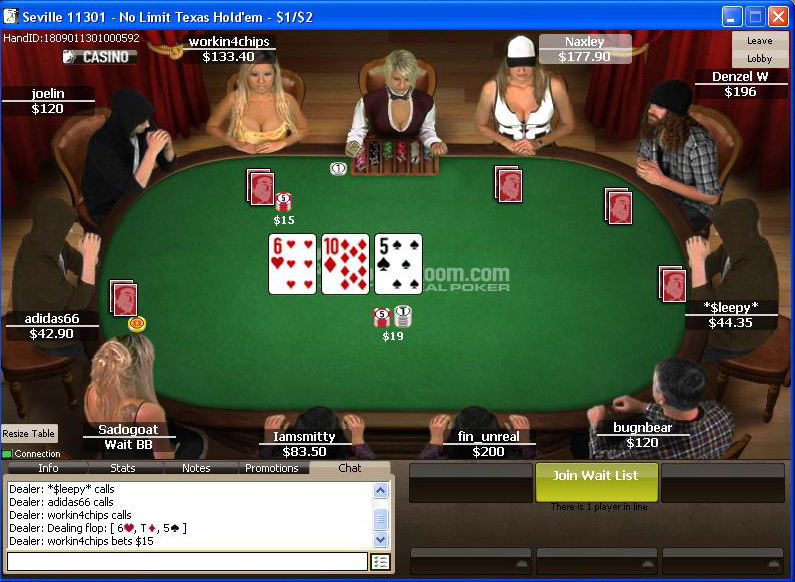 The tables are No-Limit, Fixed-Limit and Pot-Limit. The stakes begin at $0.02/$0.04 and go up to $500/$1,000 for the high rollers and the serious action seekers. As for the tables, there are tables for 2, 6, and 10 players. There is always action here and tables are usually packed with players from all over the planet, so no matter what hour you choose to play at, you will always find company here to play against. Visa, MasterCard, FirePay, Neteller, Click2Pay, Wire Transfer. Doyles Room is the 2006 winner of Bluff Magazine's top customer service, top loyalty program, top online satellites and editor's pick. Support is available by e-mail, telephone and live chat in the site. It's very professional and all inquiries are answered within 48 hours. There are plenty of tournaments to play here, so all you need to do is to pick one of many. You will find here tournaments for prize pools of $1,500, $2,500, $4,000, $50,000 and even $250,000. There are also many satellites with small entry fees that reward you with entries to more serious tournaments - a great opportunity to eventually win great cash prizes. More tournaments to find here are Satellites to Doyles Bounty Tournaments, the Irish Open, the $100,000 Gold Chip and more and more. Buy-ins range from Gold Chips you earn during play, to low costs such as $0.35 and up to high costs such as $5,100. You will also find Speed and Turbo Tournaments and the Rebuy Tournaments. There are tournaments every day, all day and the variety is really huge. With these great pool prizes all you're left to do is win them! As for the Sit-N-Go tournaments, they start from 2 players and up to 30 players. Buy-ins range from $1.10 and up to $5,100. Doyles Room offers you 110% bonus for up to $550 for your first deposit. - Doyle Brunson. 10 time winner of the WSOP, he is probably the greatest poker player ever. With many years of poker experience, you can find him at the tables and learn from him a thing or two to improve your own game. Feel like playing against him? It can be done too. Just join the room with Doyle Brunson and play against this poker legend. - Todd Brunson. Doyle's son, who is also a professional poker player and a damn good one. A regular at the high stakes games in Las Vegas, you will find Todd in the poker rooms here as well, so take a seat next to him and see if you can beat him and win some money from this pro. - Mike Caro. A close friend of Doyle Brunson and a professional poker player, who has written many poker books and is a pioneer poker theorist. - Bounty Tournaments. If you're able to hunt and eliminate the poker pro or the special guests around the poker tables, you will take home cash and lots of it! Each bounty has a $500 tag on their head and the prizes go over $25,000. - New Daily Guarantees. Guaranteed Bounties, Rebuy Tournaments, Freezeout Tournaments and other daily tournaments with prizes over $25,000. - $100,000 Guarantee. A weekly tournament held on every weekend waits for you to join and take home an incredible pile of cash. - $250,000 Guarantee. The biggest prize in the room awaits, time to play for it all. - Gold Cards. They are randomly awarded at all cash tables, and you can collect a set for $52,000. - Gold Chips. Use these Gold Chips to enter tournaments or buy merchandise. Now to a different sports than poker but an interesting one nonetheless and that's tennis. If you wish to see the best players in the world and top quality matches, think about getting your Australian Open tickets to the Australian Open Grand Slam event this January that will be held in Melbourne. When it's rainy and cold in Europe and the US, this is where you want to be and experience the best tennis matches in the world.